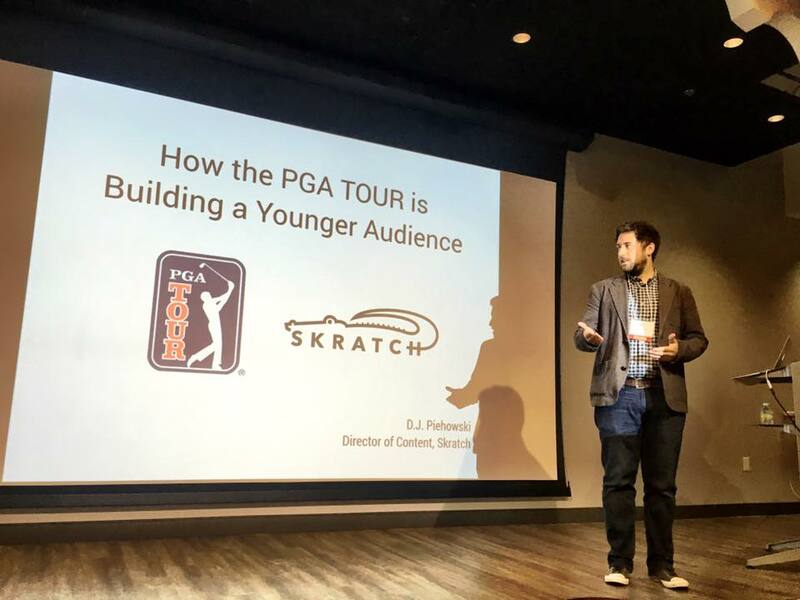 We were treated to a great presentation yesterday by PGA Golf Tour’s Skratch TV’s Director of Content D.J. Piehowski. First, off, D.J. told as that the PGA Golf tour has become a “social first organization”. There is no longer a separate department for social media. Every producer and department is in charge of social. The main goal is to reach out and go to where the fan base is. The idea behind Skratch TV is to focus on everything that makes golf fun. From what little we saw, it looks like the Skratch team is doing a great job of it. We saw many funny clips of creatively edited videos that would appeal to a younger less traditional audience (just don’t call them millenials)! As the Skratch team was starting this new platform for the PGA, they created a “character sketch”. The character’s name was Paul and they asked themselves: Where would Paul live? Who would his friends be? What do they like to do for fun? They then set out to create something that was cool, authentic, “In-the-know” (expanding beyond the PGA tour), and millenial minded but not millenials only. Prioritize your platforms and figure out how to best optimize them. ‘Other brands/influencers are looking for content too. Look for different content partnerships in your industry. These ideas can be implemented at any budget. We invite you to visit Skratch TV and see for yourselves the fun they are having in attracting and growing a younger audience.